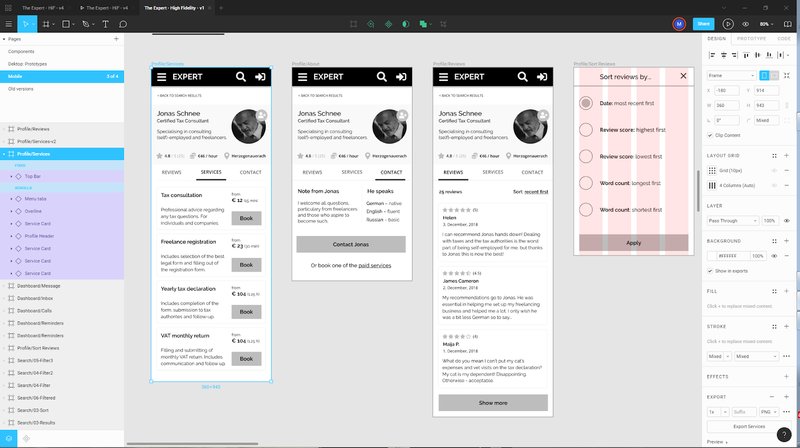 This is the third post in the series where I share my impressions from the UX Prototyping tools. As an aspiring UX designer, I'm going through the UX Design course with CareerFoundry, with the added mission to "check out" as many prototyping tools as reasonably possible. Today I'll be briefly writing about Figma. Spoiler alert: so far this is my most favourite tool, so the content of this post will be extremely biased. A higher-fidelity mockups for the same course project. Extremely easy to preview your work on a mobile device with Figma Mirror. Just open a browser on your phone and see your work real time. You can even make changes while someone else is commenting on the screens. Very smart (although a bit hard to learn) system of reusable objects. Like with Adobe XD, you can create your source objects then place their instances within your mockups. The changes to the source object will carry over to all isntances (preserving any overrides). However, unlike with Adobe XD, where you cannot swap one object for another, in Figma you can. Don't want a button to be primary - no problem, switch the object instance into secondary. Clear interface, no functionality is hidden until "the right moment" happens. You can apply multiple layout grids, for example, both pixels and columns. Active community and an engaged development team. Projects get automatically autosaved (although you can save specific versions manually). In the recent update for the desktop app, the dev team removed the standard Object, View, File menu and replace them with a hamburger menu. It's not as bad as the XD (since the hamburger actually has all the options in it), but it is still a strange an weird move that I do not find valuable. Prototypes tended to lag for my when viewing them on a mobile device. Unfortunately, I couldn't use Figma's prototype for usability testing due to this. It does have a bit of a learning curve, particularly if you want to master it and work comfortably with reusable objects. Some things are not obvious at all and you actually do need to watch some tutorial to wrap your head around this. I did get a bit frustrated with it at a certain point, but then the penny dropped and I was converted. While this wasn't important for me, it has to be noted that Figma does not have the most secure project sharing. Technically, anyone with whom you share a "view only" link can comment on your design and also copy it to their own instance of Figma. While this makes benign file sharing very easy, I can definitely see how practically anyone who is working with intellectual property would want to have more control over what the viewers can do with your file. In short: if strict confidentiality is not an issue for you and you're ready to invest a couple of hours to watch some tutorials, then Figma may be a perfect match for you.